Create a Photo Slide Show and Share Your Photos as Musical Slide shows and custom DVDs, Burn VCDs ! 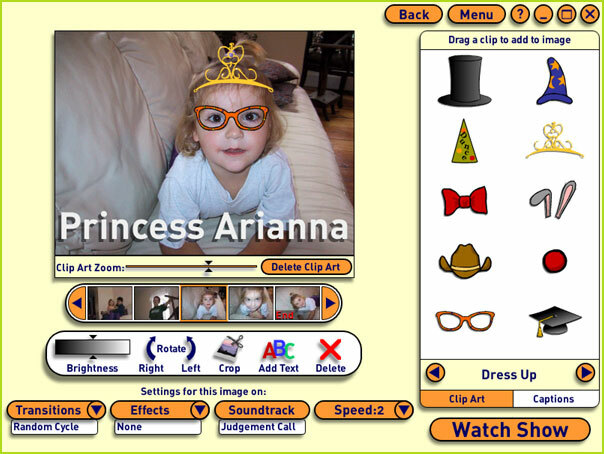 PhotoShow is the fun and easy way to create multimedia slide shows to share with friends and family. PhotoShow is the best way to share musical slideshows with friends and family around the world. Its drag and drop interface makes it easy for anyone to build a great looking slide show and publish it online in just minutes. A PhotoShow is a complete multimedia experience, complete with music. The product comes with over 100 songs spanning all genres that you can include in any show you create. Even better, you can add your favorite song from your MP3 collection to create the perfect soundtrack to your photos. A photo can be worth a thousand words, but add some clip art or a caption and it can be worth ten thousand more. With PhotoShow, you can breathe new life into to any photo in your collection. Browse through our wide variety of animated clip art, and drag your favorite onto a photo. If desired, add a line of text to amplify or even change the meaning of any picture. It can be fun to watch your own PhotoShow, but everyone loves sharing pictures with friends and family. Now sharing is easier than ever. Just select your favorite show in the 'Share' menu, PhotoShow makes it easy to email it to friends, burn it to a CD, add it for free to PhotoShow.net for web based viewing, or create HTML that enables you to publish your photos on your own web site. Iphoto - A photo maker software of downloading and presenting images from the web sites !